By popular demand, we present this recipe for apple pie; but not just any apple pie, but Mama Josie’s ¡Ay Caramba! 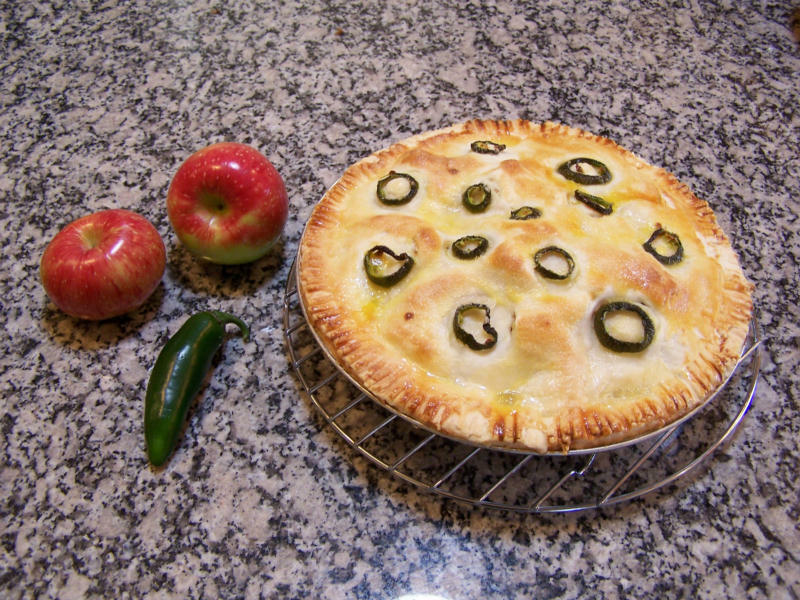 Jalapeno Apple Pie. Mix flour, sugar and salt. Blend chilled shortening in with a pastry blender. With a fork, mix in just enough water to consolidate the mix, and then press into a ball. Divide the dough in half, wrap with plastic wrap and refrigerate until well-chilled. Roll out between sheets of plastic wrap. Mix all filling ingredients in a bowl. Spoon into bottom pie shell, and cover with upper crust. Fold the upper crust over and tuck it behind the lower crust. Pinch an attractive pattern around the edge and trim off excess. Roll out a scrap piece of dough and cut out leaf and apple shapes. Place these on the center of the pie and cut 5 vent slits to vent the steam. Mix up an egg yolk with some milk or cream and brush it over the top crust, then sprinkle it with sugar. Slice up a fresh Jalapeno pepper, pick the seeds out, and place the slices on top of the crust. Wrap the edges of the crust with 2″ wide strips of aluminum foil to protect the edges from burning. Place in a 375 degree preheated oven for 25 minutes. Remove the foil and bake for 25 additional minutes. Combining Jalapeno and apple pie might seem seriously wrong to some of you, but don’t knock it ’til you try it. Vanilla ice cream goes nice with it, but if you’re from Wisconsin, by law you must have your apple pie with a slice of cheddar cheese. This week’s over-achiever is Sierra Plum. A cutting was given to me a few years ago by an elderly Japanese gentleman (who served under Gen. MacArthur in the Phillipines). I have no idea where he got it, and Sierra Plum is listed as a wild, insipid-tasting plum also known as Klamath Plum, which obviously does not fit the description of this wonderful-tasting plum. 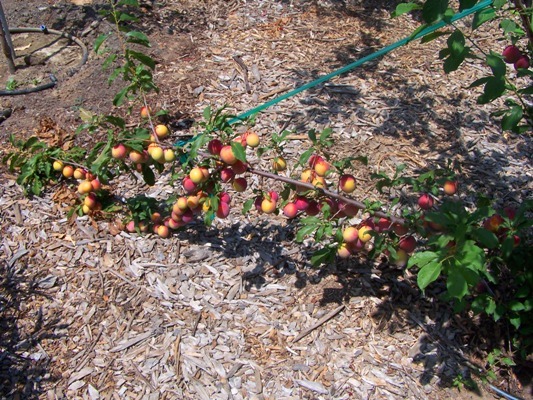 The leaves if the photos and growth habit are also quite different, and so I still have a mystery plum. No matter, I’m happy to harvest huge crops off our 3-year-old tree that explodes reliably like this every year. 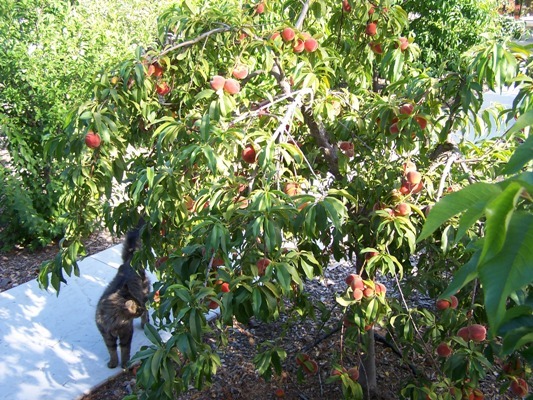 The perfect storm of stonefruit hit us this week, and we were blindsided by ripening stonefruit such as Panamit nectarine, Donut peach, Royal Apricot, Arctic Star nectarine, Santa Rosa plum, besides Anna apple, Dorsett Golden apple, and assorted figs, blueberries, blackberries, and raspberries. It could be tolerable to let some go if they were mediocre or bland, but instead they are all world-class, exploding with incredible flavor. If I had to pick a champ it would be the Panamint nectarine which about blows your head off with a sweet-tangy flavor that makes people’s eyes bug out. We’re struggling to slice, can, bake, dry, give away, and otherwise put this wonderful fruit to use. Any one of them by itself would be a welcome harbinger of summer, but all put together its almost more than I can bear.